We are pitched straight in after the events of issue #48, and you really get a sense of desolation, of the aftermath of a war. The pace is slower, but The Walking Dead never ceases to be anything less than engaging. As we return to the scene of the massacre, a familiar face surveys the battleground, clearing up one plot thread while taking care of business, as old friends threaten to reanimate. Meanwhile Rick & Carl are trying to come to terms with the horror of their loss, while having to cope with the new hostile environment they are in. They are out in the open, having to look for food and shelter, dealing with the undead 'roamers'. Kirkman even finds humour in the food hunt as Carl, despite his experiences, shows a childs petulence when faced with 'crappy cereal'. As the issue progresses we focus on Rick & Carl. It is a simply told issue, not a lot happens, but the small touches, such as Carls all too obvious grief, are touching and are made so by Adlards sterling artwork. 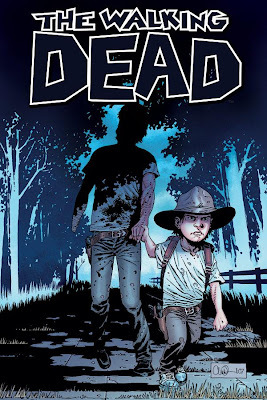 Verdict - quieter, more understated, but Kirkman is tantalising us with possibilities while delivering another mighty cliffhanger. Up to the usual standard. 9 out of 10.